The 24th-ranked Green Bay Phoenix increased their winning streak to 10 games, rolling to a 84-51 win over Youngstown State on Thursday night. The Phoenix (18-2, 9-0 HL) trailed after the first quarter, 19-18. But Green Bay opened the second quarter on a 7-0 run, then ended the half on a 14-0 run to lead 40-24 at halftime. 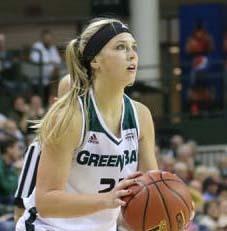 Jessica Lindstrom led the Phoenix with 19 points and 12 rebounds, her ninth double-double of the season. Mehryn Kraker added 17 points and six rebounds. The Phoenix play next at Cleveland State on Saturday at noon. Steph Kostowicz hit a buzzer beating game winner for the Milwaukee Panthers, who knocked off Cleveland State 80-78 at the Wolstein Center. The Panthers (14-6, 6-3 HL) overcame a 13-point deficit in the first half and took the lead before halftime. Sierra Ford-Washington started the game winning play with the ball, dishing to Kostowicz with six seconds left. Kostowicz drove and scored on a reverse layup for the win.